New book, 95 pages. Few mechanics are entirely devoid of springs of one sort or another, but satisfactory operation rests on details such as spring strength and degree of movement. Yet information on calculating and making springs is not easily available. This book explains the property of each type of spring, plus essential materials and methods. Engineers, professional or amateur, often find designing springs difficult due to the number of variables and the complexity of the formulae. The book also introduces the designer to charts and nomograms, which greatly simplify the process. 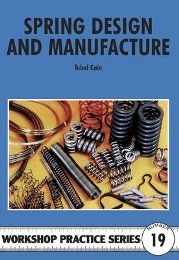 Tubal Cain draws on several decades of experience in the actual processes and covers the design and manufacture of compression and extension coil springs, simple and compound leaf springs, torsion springs and torsion bars, springs relying on bending actions and a useful graphical method of designing valve springs for IC engines. Contents: Tension and Compression Spring Principles; Compression and Tension Spring Design; Worked Examples; Winding Coil Springs; Leaf Spring Principles; Leaf Spring Design; Making Leaf Springs; Torsion Springs; I.C. Engine Valve Springs.